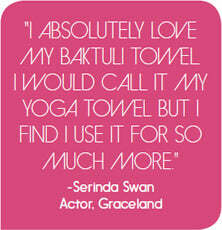 Baktuli is a line of stylish towels designed using premium lightweight Turkish cotton. Each towel is inscribed with an inspirational quote to honour yoga's mind-body connection and encourage positive mental attitudes during practice. Microban protection fights the growth of odor-causing bacteria, mold and mildew to keep fabrics fresher for longer than ever before. Our new towel is uniquely designed to be worn like a scarf, and sized to fit a workout bench to a tee. It's the perfect workout partner.